Now in its fourth edition, the Handbook has become synonymous with excellence in providing cutting edge research on educational communications and technology to the information and communication technology community. This Handbook is written for researchers in educational communication and technology, professors of instructional design and instructional technology as well as professionals working in the fields of ICT, Learning Sciences, Educational Technology, IT, and ID. In addition, it has been and will continue to be an invaluable reference for academic and professional libraries. Under the sponsorship of the Association for Educational Communications and Technology (AECT), an international cadre of authors has been assembled representing the absolute best in the field. Expanded from 56 to 74 chapters, topics covered range from methodology, instructional strategies, assessment, design models, implementation and technology integration. A full 15 chapters are devoted to examining the future of the field, including robust discussions of new and emerging technologies and the fostering of ICT research in the developing world. This completely expanded and updated Handbook will become an indispensible addition to the field; anyone with an interest in the field of educational communications and technology will find their library enriched for including it. 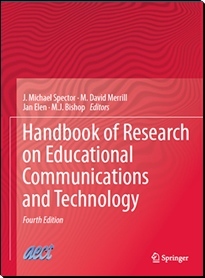 Click here for access to the Fourth Edition of Handbook of Research for Educational Communications and Technology. As a member benefit, the 'Handbook of Research for Educational Communications and Technology' is presented on our site. New memberships can be established through AECT'sOnline Store.